Ah. Ed Zander's downfall. Thank you for giving the opportunity for an obscure reference from my own culture:). 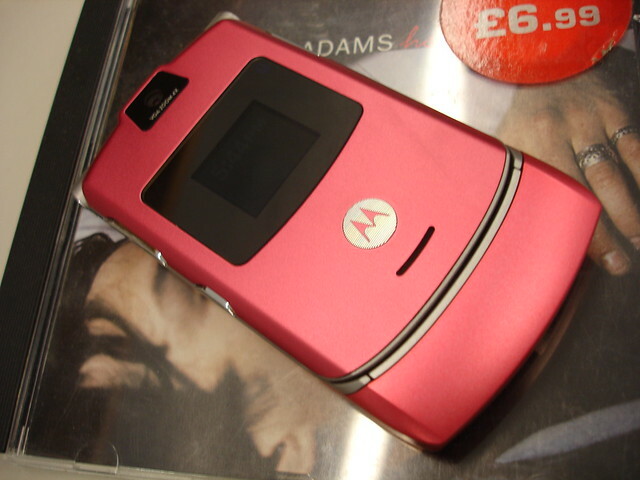 pre-pinky, when we were living in san francisco c. 2002, i participated in one of those high-paying consumer interviews about cell phone usage and ended up chatting with the motorola reps once we were finished. i was in the market for a new device and asked them for advice; ZOMG ANYTHING BUT MOTOROLA, they both said. unrelated: i tried to honor pinky's legacy by choosing a smartphone which also looks like a stripper's accessory. Wait, does this mean you are going over to the dark side? My Nokia feels so lonely now. Celia is down, now you too? Am I the only holdout? I had that phone too, I miss it. I have a 'smart' phone now but it's the dumbest smart phone that ever lived. Also the cheapest. i did. i started getting frantic calls and letters from at&t telling me that their network no longer supported my phone, and if i'd just give up on pinky, i could have a new phone for free without a new contract; that coupled with the fact that joe needed a new phone/contract (he just started a new job, and his work phone at his previous job was his only phone) turned me. nevertheless, i feel cheap and dirty and weird. i transferred pinky's hooters wallpaper to the new phone, but it isn't the same. Is the Heartbreaker backdrop pure coincidence, or thematic reinforcement of your eulogy? a little of column A, daniel, a little of column B.
Gah. I wonder if this means I'm not going to last much longer. I do get tired of texting with the numeric keypad, but the feeling of superiority pretty much makes up for it. i'm assuming i'll be finding you on instagram soon? sleep the sleep of the just. update: the iphone is pretty good for taking pictures of garbage when i'm walking to work (NO INSTAGRAM). it's not very good at screening calls or letting me check my voicemail.